Doubt inspires fear and insecurity, usually. “I’m not sure you can do it,” motivates those driven to prove you wrong. Doubt fuels performance when seven things are true. Goals are tough but achievable. You willingly say, “I didn’t think you could, but you did it,” when they succeed. Don’t expect doubt to motivate if nothing is ever good enough. I had breakfast with an executive who floundered after being promoted. He was ready to throw in the towel. But his COO believed in him. She invested in a coach that helped him find his bearings and rise to new challenges. It might have been easier and safer to manage him out. But, she stood with him. Two years later, how do you think he feels about his leader? “I believe you can,” motivates those facing new challenges and uncertain results. They need a leg up, not a kick in the pants. Coddling gives believing a bad name. Some might think if you believe in someone you pat them on the back for doing nothing. You mouth the words, “You’re awesome,” regardless of what they do. 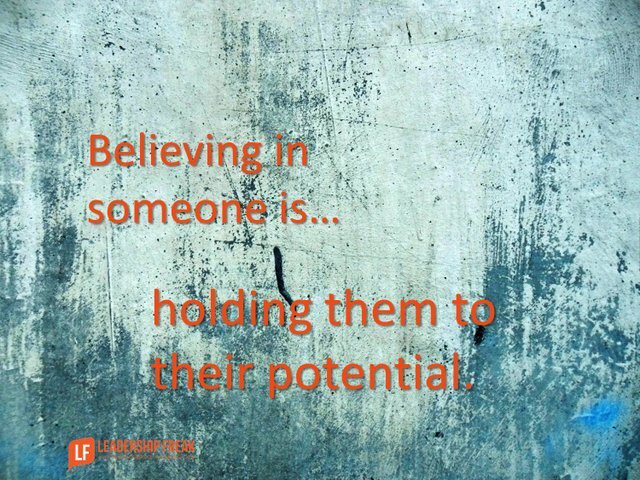 Believing in someone isn’t patting them on the back for doing nothing. A track record of improvement. Doubt those who haven’t performed. Holding people to their potential. Trusting them to rise up after failure. Taking action to mitigate weaknesses. Honoring success when it’s different from yours. Belief ennobles both the giver and receiver. How might leaders use doubt to motivate? Has someone believed in you? What was that like? What happened? My teacher in High School believed in me, so much and she was happy with my thesis with subject Professional Development. She saw it in me. Now back to doubt as instrument for a leader. It can strengthen someone who is confident of himself I think. Super confident. But someone who has low self-esteem needs to be encourages, by being realistic and that also sometimes includes coaching with doubt. I think again. Often, it seems that the use of doubt to motivate others is a slippery slope. If there is not a good relationship between the two professionals, then doubts use can act as counter to that which it set-out to do; that is, motivate. It’s somewhat like this, I can most definitely use a sword to shave, but I prefer my hand-held razor, as I more comfortably wield it about my face. With appropriate professional engagement, doubt–rather, a challenge that seems improbable–may be precisely what a professional needs. For me, the key take away from the doubt section noted above is the reminder that the first key in leading people well is being relationally invested. When I engage a professional at the shoulder-to-shoulder level, it is only then that I may have the ability to encourage them. And, then, only after encouragement—through belief or doubt—that they may be empowered to push forward. WOW!!!!!!!!!!!! How TOTALLY perfect this is for today and the upcoming meeting!!!!!!!!!!!!!!!!!!!!!!!!!! “Believing in someone isn’t patting them on the back for doing nothing.” Every one of these points is perfect!! I firmly believe without others believing in us along the way, we would not be here today! More importantly you have to believe in yourself, seek guidance, learn as much as possible, cherish your time as best you can, enjoy life and others along the way, push yourself to the limits, if you doubt yourself ask for help, it is out there too! We are only as strong as our weakest link, which we can control, by educating, consulting others, learning from our mistakes, and seeking out the answers to our questions. Thanks Dan, this was helpful. Not only as I think of my employees, but also as I consider my interactions with my adult children. Without a shadow of a doubt I think this freaky blog will resonate with most of us during stages of life. I like what Dennis M. said about doubt “It can strengthen someone who is confident of himself I think” …. I too think people who have good self esteem almost interpretia doubt statement as a dare dependant by whom and how the message is delivered and the relationship established. As for belief it takes a big open heart to openly show and profess it. The threat effect has many negative impacts in working relationships and can stunt progressive forward thinking. Doubt about one’s potential is sometimes good for self development. however, it also has a limitation, always doubt about self does not the indicator of self confidence and extra ordinary personality instead it build a negative character and tarnish the image. sometimes because of continuous failure it raise a doubt about the behavior and approach, here the real leader bounce back and prove the point that he is down but not out. A good coach & Mentor help to bring the real talent out of the leader and develop him as a complete person, it is always better to judge ourselves by continuous asking probing question. that raise the bar. Very thoughtful blog and comments – thank you. As a child I can remember my father always believing in me and my ability to do anything I set about to do. Sooo many years later, I still can jump into new adventures in life, confident in my abilities, even when I make mistakes, based on his constant belief in me as a child (he died when I was 18) and I think his constant support also helped develop my positive approach to life and my addiction to learning -huge gifts that I am grateful for every day. Dan, thank you for the blog today. And, thanks to the many commenters. This is a very fitting message for those in every function and industry. The people who have sincerely believed in you live on forever in your mind and heart. I remember my sixth-grade English teacher handing back essays we had written and making comments for every student as she walked along the rows of desks. I can still hear her voice and see her face when she said, “Cheryl, you certainly have a flair for writing!” I still cherish that moment, as well as all the ways that she would challenge me throughout that year. In my previous job I made a point of motivating my folks and the getting out of the way. The trick is avoid the temptation to micromanage your employees success because they will never believe they were the reason for their own success.